The crew of Apollo 7 transmitted the first live television broadcast aboard an American manned spacecraft. Apollo 7 was an October 1968 human spaceflight mission carried out by the United States. It was the first mission in the United States' Apollo program to carry a crew into space. It was also the first U.S. spaceflight to carry astronauts since the flight of Gemini XII in November 1966. The AS-204 mission, also known as "Apollo 1", was intended to be the first manned flight of the Apollo program. It was scheduled to launch in February 1967, but a fire in the cabin during a January 1967 test killed the crew. Manned flights were then suspended for 21 months, while the cause of the accident was investigated and improvements made to the spacecraft and safety procedures, and unmanned test flights of the Saturn V rocket and Apollo Lunar Module were made. Apollo 7 fulfilled Apollo 1's mission of testing the Apollo command and service module (CSM) in low Earth orbit. The Apollo 7 crew was commanded by Walter M. Schirra, with senior pilot / navigator Donn F. Eisele, and pilot / systems engineer R. Walter Cunningham. Official crew titles were made consistent with those that would be used for the manned lunar landing missions: Eisele was Command Module Pilot and Cunningham was Lunar Module Pilot. Their mission was Apollo's 'C' mission, an 11-day Earth-orbital test flight to check out the redesigned Block II CSM with a crew on board. It was the first time a Saturn IB vehicle put a crew into space; Apollo 7 was the first three-person American space mission, and the first to include a live TV broadcast from an American spacecraft. It was launched on October 11, 1968, from what was then known as Cape Kennedy Air Force Station, Florida. Despite tension between the crew and ground controllers, the mission was a complete technical success, giving NASA the confidence to send Apollo 8 into orbit around the Moon two months later. The flight would prove to be the final space flight for all of its three crew members—and the only one for both Cunningham and Eisele—when it splashed down in the Atlantic Ocean on October 22, 1968. It was also the only manned launch from Launch Complex 34, as well as the last launch from the complex. Lunar Module Pilot was the official title used for the third pilot position in Block II missions, regardless of whether the LM spacecraft was present or not. The backup crew became the prime crew on Apollo 10. Schirra, Eisele, and Cunningham were first named as an Apollo crew on September 29, 1966. They were to fly a second Earth orbital test of the original Block I command and service module (not designed to dock with the lunar module for lunar flight) after Apollo 1, the first manned flight, to be made by Virgil "Gus" Grissom, Ed White, and Roger Chaffee. In December 1966, the second mission was deemed redundant and canceled, and Schirra's crew were reassigned as Grissom's backup. Plans for the first manned Apollo flights were completely disrupted by the January 27, 1967 cabin fire which killed Grissom, White, and Chaffee. Schirra, Eisele, and Cunningham were later named as prime crew for the first manned flight, which would now use the Block II spacecraft designed for the lunar missions. The command module (CM) and astronauts' spacesuits had been extensively redesigned, to reduce and eliminate the chance of a repeat of the accident which killed the first crew. Schirra thus became the only astronaut to fly Mercury, Gemini and Apollo missions. His crew would test the life support, propulsion, guidance and control systems during this "open-ended" mission (meaning it would be extended as it passed each test). The duration was limited to 11 days, reduced from the original 14-day limit for Apollo 1. Since it flew in low Earth orbit and did not include the lunar module (LM), Apollo 7 was launched with the Saturn IB booster rather than the much larger and more powerful Saturn V.
Throughout the Mercury and Gemini programs, McDonnell Aircraft engineer Guenter Wendt had been leader of the spacecraft launch pad teams, with ultimate responsibility for condition of the spacecraft at launch. He earned the astronauts' respect and admiration, including Schirra's. However, the spacecraft contractor had changed from McDonnell (Mercury and Gemini) to North American Rockwell (Apollo), so Wendt was not the pad leader for Apollo 1. So adamant was Schirra in his desire to have Wendt back as Pad Leader for his Apollo flight, that he got his boss Deke Slayton to persuade North American management to hire Wendt away from McDonnell, and Schirra personally lobbied North American's launch operations manager to change Wendt's shift from midnight to day so he could be pad leader for Apollo 7. Wendt remained as Pad Leader for the entire Apollo program. Wendt's face was the last they saw before the hatch was sealed, and immediately after liftoff Eisele said with a mock German accent into his radio, "I vonder vere Guenter Vendt?" The first manned American space flight in 22 months lifted from LC-34 at 15:02:45 UTC on Friday, October 11, 1968. Liftoff proceeded flawlessly; the Saturn IB performed well on its first manned launch and there were no significant anomalies during the boost phase. The astronauts described it as very smooth riding compared to the rough, bumpy Titan II used to launch the Gemini spacecraft. During the countdown, the wind was blowing in from the east. To launch under these weather conditions was in violation of safety rules since in the event of a launch vehicle malfunction and abort, the command module would touch down on land in Florida, which would be rough and have the potential for the crew to be seriously injured or killed. Apollo 7 was still equipped with the old Apollo 1-style crew couches, which did not provide adequate shock protection in the event of a terrestrial landing. The crew couches had been since redesigned, but the new units were not ready in time for the launch. While seated inside the command module, Schirra protested that launching with the wind going east to west was dangerous, but these complaints were ignored by the blockhouse crew. Following orbital injection and separation from the S-IVB, the crew turned the CSM around using its Reaction Control System thrusters, and Eisele practiced a simulated lunar module rendezvous and docking, using a visual reference target mounted inside the spacecraft adapter in the same radial position it occupied on the LM. One of the adapter panels on the S-IVB failed to completely deploy to its 45 degree open position, reminding CAPCOM Tom Stafford of his "angry alligator" experience on Gemini 9A, when docking was prevented by mis-deployed adapter panels. Had this been an actual lunar mission, the astronauts might have found the process of LM extraction from the adapter more difficult, risking possible damage. This reinforced the decision to add a system to completely separate and jettison the panels on all subsequent Apollo-Saturn V flights. The Apollo hardware and all mission operations worked without any significant problems, and the service propulsion system (SPS), the all-important engine that would place Apollo into and out of lunar orbit, made eight firings, performing within 1% of the engine acceptance test thrust and specific impulse values. As the Saturn IB itself had performed very smoothly during launch, the astronauts were unprepared for the sudden violent jolt they received upon first activating the SPS, leading to Schirra yelling "Yabbadabbadoo!" in reference to The Flintstones cartoon. Don Eisele called it "a real boot in the rear." An assortment of minor hardware problems occurred over the flight; these included the drinking water hose trigger sticking during the final two days, a momentary undervoltage of the main AC buses caused by the automatic cryo fan switch in the service module LOX and LH2 tanks, and a loss of telemetry due to a malfunctioning electrical commutator following SM jettison at the end of the mission, meaning that the final 15 minutes of data transmission were lost. Aside from the last event, which remained a mystery despite postflight testing of the commutator, all of the problems on Apollo 7 were quickly resolved and some of them also involved equipment or procedures that would not be used on subsequent missions. Apollo promised the best food preparation yet seen on a manned spacecraft. For the first time, astronauts had both hot and cold water to prepare meals with (the food came in freeze-dried vacuum packs that would be injected with water or else eaten dry followed by a sip of water) and Wally Schirra, who had had only toothpaste-like tubes for food on his Mercury flight, described the food as "Still does not match home cooking, but it comes a lot closer than space food used to." Thirty-three meals were provided for the three crewmen, allowing them three meals a day for each of the 11 days in space. Even so, the astronauts complained that there was more food than they could eat and that most of it was too sweet, although the menus had been prepared based on their personal preferences. Early fears that the movement of the astronauts inside the CM would make it hard for the spacecraft's attitude control system to stabilize it proved unfounded, and they reported that motion was "incredibly easy" with no gravity to work against. As sleeping in the fetal position was cramping and painful, a stretching device called the Exer-Genie was provided for relaxing aching muscles. Another mission goal was the first live television broadcast from an American spacecraft (Gordon Cooper had transmitted slow scan television pictures from Faith 7 in 1963, which were never broadcast). It was initially scheduled for midday on day two, but Schirra was concerned with the broadcast interfering with the rendezvous test. SCHIRRA: You've added two burns to this flight schedule, and you've added a urine water dump; and we have a new vehicle up here, and I can tell you at this point TV will be delayed without any further discussion until after the rendezvous. CAPCOM 1: All we've agreed to do on this is flip it. CAPCOM 1: All we have agreed to on this particular pass is to flip the switch on. No other activity is associated with TV; I think we are still obligated to do that. CAPCOM 1 (Deke Slayton): Okay. I think you ought to clearly understand that there is absolutely no experience at all with landing without the helmet on. CAPCOM 1: That one we've got a lot of experience with, yes. CAPCOM 1: Okay. I guess you better be prepared to discuss in some detail when we land why we haven't got them on. I think you're too late now to do much about it. SCHIRRA: That's affirmative. I don't think anybody down there has worn the helmets as much as we have. CAPCOM 1: Understand that. The only thing we're concerned about is the landing. We couldn't care less about the reentry. But it's your neck, and I hope you don't break it. CAPCOM 1: Over and out. Exchanges such as this led to Eisele and Cunningham being rejected for future missions (Schirra had already announced his impending retirement from NASA). Some[who?] have observed that the psychology unique to the high-stress spaceflight environment that led to such workplace tension was poorly grasped at the time, but it became better understood during the Skylab program and especially by the much-later Shuttle–Mir Program. The splashdown point was 27°32′N 64°04′W﻿ / ﻿27.533°N 64.067°W﻿ / 27.533; -64.067, 200 nautical miles (370 km) SSW of Bermuda and 7 nmi (13 km) north of the recovery ship USS Essex. Despite the difficulties between the crew and Mission Control, the mission successfully met its objectives to verify the Apollo command and service module's flight worthiness, allowing Apollo 8's flight to the Moon to proceed just two months later. Apollo 7 was Project Apollo's only human spaceflight mission to launch from Cape Kennedy Air Force Station's Launch Complex 34. All subsequent Apollo and Skylab spacecraft flights (including Apollo–Soyuz) were launched from Launch Complex 39 at the nearby Kennedy Space Center. Launch Complex 34 was declared redundant and decommissioned in 1969, making Apollo 7 the last human spaceflight mission to launch from the Cape Air Force Station in the 20th century. As of January 2019, Cunningham is the only surviving member of the crew. Eisele died in 1987 and Schirra in 2007. The insignia for the flight shows a command and service module with its SPS engine firing, the trail from that fire encircling a globe and extending past the edges of the patch symbolizing the Earth-orbital nature of the mission. The Roman numeral VII appears in the South Pacific Ocean and the crew's names appear on a wide black arc at the bottom. The patch was designed by Allen Stevens of Rockwell International. After the mission, NASA awarded Schirra, Eisele, and Cunningham its Exceptional Service Medal in recognition of their success. On November 2, 1968, President Lyndon Johnson held a ceremony at the LBJ Ranch in Johnson City, Texas, to present the astronauts with the medals. He also presented NASA's highest honor, the Distinguished Service Medal, to recently retired NASA administrator James E. Webb, for his "outstanding leadership of America's space program" since the beginning of Apollo. Schirra, Eisele, and Cunningham were the only crew, of all the Apollo, Skylab, and Apollo-Soyuz Test Project missions, who had not been awarded the Distinguished Service Medal immediately following their missions (though Schirra had received the medal twice before, for his Mercury and Gemini missions). Therefore, NASA administrator Michael D. Griffin decided to belatedly award the medals to the crew in October 2008, "[f]or exemplary performance in meeting all the Apollo 7 mission objectives and more on the first manned Apollo mission, paving the way for the first flight to the Moon on Apollo 8 and the first manned lunar landing on Apollo 11." Only Cunningham was still alive at the time; Eisele's widow accepted his medal, and Apollo 8 crew member Bill Anders accepted Schirra's. Other Apollo astronauts, including Neil Armstrong, Buzz Aldrin, and Alan Bean, were present at the award ceremony. Former Flight Director Christopher C. Kraft Jr., who had been in conflict with the crew during the mission, sent a conciliatory video message of congratulations, saying: "We gave you a hard time once but you certainly survived that and have done extremely well since ... I am frankly, very proud to call you a friend." In January 1969, the Apollo 7 command module was displayed on a NASA float in the inauguration parade of President Richard M. Nixon. For nearly 30 years the command module was on loan (renewable every two years) to the National Museum of Science and Technology, in Ottawa, Ontario, along with the space suit worn by Wally Schirra. In November 2003, the Smithsonian Institution in Washington, D.C., requested them back for display at their new annex at the Steven F. Udvar-Hazy Center. Currently, the Apollo 7 CM is on loan to the Frontiers of Flight Museum located next to Love Field in Dallas, Texas. On November 6, 1968, comedian Bob Hope broadcast one of his variety television specials from NASA's Manned Spacecraft Center in Houston to honor the Apollo 7 crew. Barbara Eden, star of the popular comedy series I Dream of Jeannie, which featured two fictional astronauts among its regular characters, appeared with Schirra, Eisele and Cunningham. Schirra parlayed the head cold he contracted during Apollo 7 into a television advertising contract as a spokesman for Actifed, an over the counter version of the medicine he took in space. The Apollo 7 mission is dramatized in the 1998 miniseries From the Earth to the Moon episode "We Have Cleared the Tower", with Mark Harmon as Schirra, John Mese as Eisele, Fredric Lehne as Cunningham, and Max Wright as Wendt. A documentary produced by George Van Valkenburg, The Log of Apollo 7, has been restored from 16 mm film and posted online. ^ Orloff, Richard W. (September 2004) [First published 2000]. "Table of Contents". Apollo by the Numbers: A Statistical Reference. NASA History Division, Office of Policy and Plans. NASA History Series. Washington, D.C.: NASA. ISBN 0-16-050631-X. LCCN 00061677. NASA SP-2000-4029. Archived from the original on August 23, 2007. Retrieved July 6, 2013. ^ "Apollo 7 Mission Report" (PDF). Washington, D.C.: NASA. December 1, 1968. p. A-47. ^ a b "Apollo 7 Crew". airandspace.si.edu. National Air and Space Museum. Retrieved April 19, 2018. ^ a b Watkins, Thomas (May 3, 2007). "Astronaut Walter Schirra dies at 84". Valley Morning Star. Harlingen, Texas. Associated Press. Retrieved October 4, 2013. ^ Karrens, Ed (Announcer) (1968). "1968 Year in Review: 1968 in Space". UPI.com (Radio transcript). E. W. Scripps. United Press International. Retrieved July 6, 2013. ^ a b c Portree, David S. F. (September 16, 2013). "A Forgotten Rocket: The Saturn IB". Wired. New York: Condé Nast. Retrieved October 4, 2013. ^ Pearlman, Robert Z. (May 3, 2010). "Guenter Wendt, 86, 'Pad Leader' for NASA's moon missions, dies". collectSPACE. Robert Pearlman. Retrieved June 12, 2014. ^ Ryba, Jeanne (July 8, 2009). "Apollo 7". NASA. Retrieved May 27, 2017. ^ Jones, Tom (October 2018). "The Flight (and Fights) of Apollo 7". Air & Space Magazine. ^ a b c d Wade, Mark. "Apollo 7". Encyclopedia Astronautica. Archived from the original on October 12, 2008. Retrieved October 24, 2008. ^ "Apollo 7 Mission Report" (PDF). NASA. December 1, 1968. pp. 5–158. ^ "Schirra rules no telecast". The Windsor Star. Windsor, Ontario. United Press International. October 12, 1968. p. 1. Retrieved October 6, 2013. ^ "Apollo 7 Air-to-Ground Voice Transcriptions" (PDF). NASA. pp. 117–118. Retrieved October 24, 2008. ^ "Apollo 7 Air-to-Ground Voice Transcriptions" (PDF). NASA. p. 1170. Retrieved May 27, 2017. ^ a b c Pearlman, Robert Z. (October 20, 2008). "First Apollo flight crew last to be honored". collectSPACE. Robert Pearlman. Retrieved June 12, 2014. ^ The Air Force Station was originally named Cape Canaveral, but the name was changed to Cape Kennedy by President Lyndon B. Johnson shortly after President John F. Kennedy's death in November 1963. The name Canaveral was reverted in 1973. ^ Hengeveld, Ed (May 20, 2008). "The man behind the Moon mission patches". collectSPACE. Robert Pearlman. Retrieved July 6, 2013. "A version of this article was published concurrently in the British Interplanetary Society's Spaceflight magazine." (June 2008; pp. 220–225). ^ Johnson, Lyndon B. (November 2, 1968). Remarks at a Ceremony Honoring the Apollo 7 Astronauts and Former NASA Administrator James E. Webb (Speech). Reception at LBJ Ranch, Johnson City, Texas. The American Presidency Project. ^ "40th Anniversary of Mercury 7: Walter Marty Schirra Jr". nasa.gov. 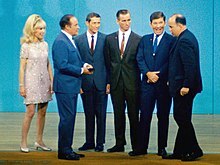 Farmer, Gene; Hamblin, Dora Jane; Armstrong, Neil; Collins, Michael; Aldrin, Edwin E. Jr. (1970). First on the Moon: A Voyage with Neil Armstrong, Michael Collins, Edwin E. Aldrin Jr. Epilogue by Arthur C. Clarke (1st ed.). Boston: Little, Brown and Company. ISBN 0-71-810736-5. LCCN 76103950. OCLC 71625. Steven-Boniecki, Dwight (2010). Live TV From the Moon. Burlington, Ontario: Apogee Books. ISBN 978-1-926592-16-9. OCLC 489010199. Schirra, Wally; Billings, Richard N. (1988). Schirra's Space. Blujacket Books. Annapolis, MD: Naval Institute Press. ISBN 1-55750-792-9. LCCN 95024817. Wikimedia Commons has media related to Apollo 7.